Robert Mealey spent more than 50 years promoting the value of trees in the mid-valley. SWEET HOME — Robert Mealey spent his lifetime growing and harvesting trees, both for the taxpayers of Oregon and on his almost 600-acre Mountain View Tree Farm near Foster Reservoir. Mealey, who died in 2007 at the age of 94, especially wanted to see the Willamette Valley strain of ponderosa pine restored to the valley. In his honor, the Linn County Small Woodlands Association and Linn County Parks are researching the possibility of developing a working demonstration forest at Sunnyside Park. The Willamette Valley strain of ponderosa pine is found naturally along the perimeter of the Willamette Valley, and it can grow well in a variety of conditions that would prove marginal for other species. Park Director Brian Carroll recently gave members of the Linn County Small Woodlands Association a tour of the proposed site between the play area and fishing ponds on the park's northeast side. The demonstration forest would include walking paths, other native trees, picnic tables and a memorial kiosk that features educational materials. Carroll said the Parks Commission is supportive of the concept, but it hasn't come before the Board of Commissioners yet. The project would be funded by a trust created by Mealey in 1998. Small Woodlands Association President Lee Peterman said his group is excited to be working with the county. “I believe this interpretive walk with trees will be a great addition to the Linn County park system and Sunnyside Park in particular,” he said. Association members have also talked with Sweet Home officials about a similar project at the new City Hall site on Main Street. The RHM Pine Fund was established in 1998 with money from the sale of 600,000 ponderosa pine seedlings and other seed sales. The Mealey family is one of Sweet Home’s founding families. In 1852, then 21-year-old Charles Mealey ventured from Ohio. In the 1870s, he homesteaded 160 acres on Wiley Creek east of Sweet Home. Bob Mealey was born in 1912 and grew up in the area that is now Foster Reservoir. He graduated from Sweet Home High School in 1932 and from Oregon State College in 1936, the same year he married Anna McLaughlin. His forestry career spanned 50 years. He ran a logging and sawmill company, set up the Linn County Small Woodlands Association, and worked for the U.S. Forest Service, including supervising the Tillamook Burn reforestation crews and completing the fire mapping of the Olympic National Forest in western Washington. He was a district ranger on the Rigdon and Blue River Ranger Districts. In 1989, Mealey was recognized as the Oregon and Western United States Regional Outstanding Tree Farmer. 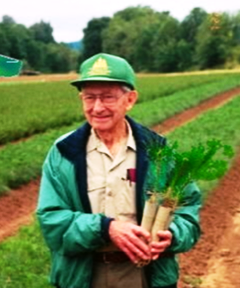 In 2000, the Robert H. Mealey Willamette Valley Ponderosa Pine Native Gene Conservancy Orchard was dedicated at the Oregon Department of Forestry’s Schroeder Seed Orchard near St. Paul.